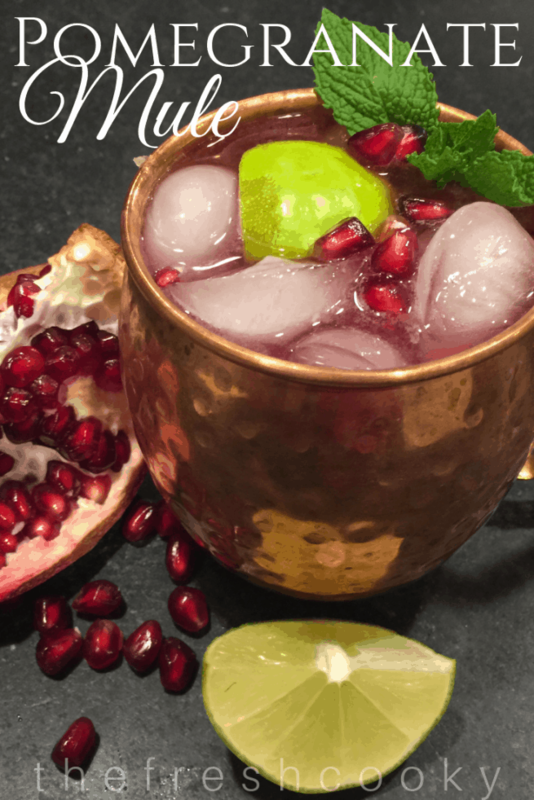 The pomegranate mule is fresh, vibrant and festive! With fresh pomegranate juice, lime and vodka splashed with a lively ginger beer. If you don’t have copper mugs that is okay, just use a pretty glass and fill with ice. The reason behind copper mugs is for temperature control, the metal holds down the temperature and the handle keeps the warmth of our bodies from warming the drink. Read more about the history of the Moscow Mule. Fill the cup with ice, and measure out 2 oz of vodka* (flavor infused vodka is yummy too, over the holidays I used Deep Eddy’s Cranberry Vodka) and pour over ice. Pour in 2 oz of Pomegranate juice and then squeeze ½ a lime and pour over vodka, top with ginger beer, give a gentle stir and if desired, add a mint sprig and a few pomegranate arils**. Enjoy immediately. Do you have a mini measuring cup? It’s 2 ounces and I use mine all the time. *If a lighter alcoholic drink is in order (for a luncheon or a lightweight, like me) use 1 oz. of vodka and increase your pomegranate juice to 3 oz., or just make up the difference with the ginger beer, which is non-alcoholic. It is also simple to make this non-alcoholic for kids or adults. Simply omit the vodka and increase the pomegranate juice and ginger beer. **Usually starting late fall through winter, you can purchase pomegranates already seeded in the produce section or even better because they are so much fresher; purchase a pomegranate! To remove the seeds, score the skin in quarters, carefully pull a quarter away and gently pull at the base of the seeds. 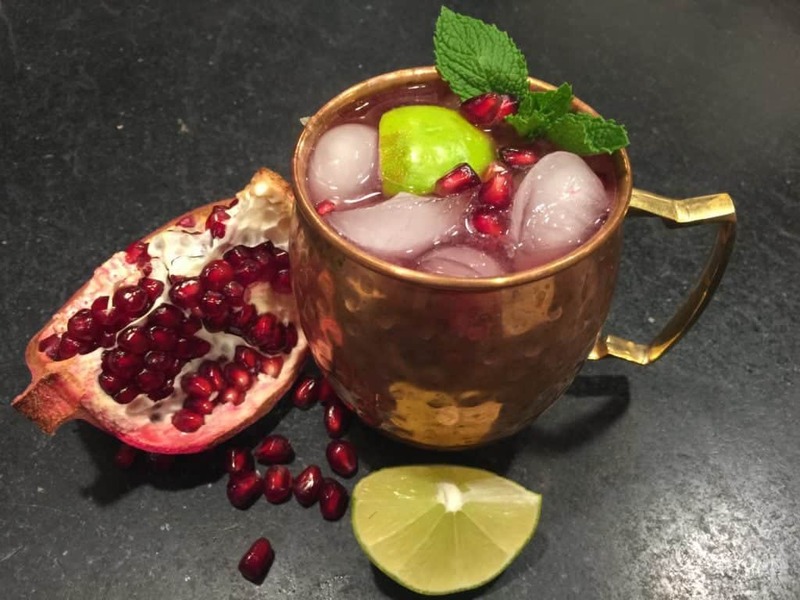 This simple Pomegranate Mule is a simple, vibrant, festive mule for your holiday parties. Fresh pomegranate, lime juice, ginger beer and fresh mint, is a winning combination. Fill the cup with ice, and measure out 2 oz of vodka* (flavor infused vodka is yummy too, over the holidays I used Deep Eddy’s Cranberry Vodka) and pour over ice. Pour in 2 oz of Pomegranate juice and then squeeze ½ a lime and pour over vodka, top with ginger beer, give a gentle stir and if desired. Add a mint sprig and a few pomegranate arils**. Enjoy immediately. If a lighter alcoholic drink is in order (for a luncheon or a lightweight, like me) use 1 oz. of vodka and increase your pomegranate juice to 3 oz., or just make up the difference with the ginger beer, which is non-alcoholic. It is also simple to make this non-alcoholic for kids or adults. Simply omit the vodka and increase the pomegranate juice. Usually starting late fall through winter, you can purchase pomegranates already seeded in the produce section or even better because they are so much fresher; purchase a pomegranate, score the skin in quarters, carefully pull a quarter away and gently pull at the base of the seeds.